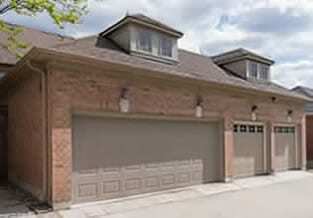 When you need garage door repair in Denton, look to the experts at Action Garage Door. We’ve provided top-notch garage door repair service for three decades, earning the trust of thousands of people throughout the Dallas area and across Texas. We look forward to the opportunity to earn your trust as well. Nobody can top Action Garage Door when it comes to customer care. All of the employees at our family-owned business are committed to helping people access high-quality, affordable garage door repair and installation services in Denton and throughout the state. As part of that passion for delivering 100 percent customer satisfaction, we always perform our work in total compliance with local regulations and use reliable products built to handle all kinds of weather conditions. Garage door service and repair for Denton residents is one of the things Action Garage Door Repair handles routinely and well. Ask almost anyone in these parts and you’ll be happy to hear the responses of satisfied customers. Our record spans three decades in major cities and their surrounding suburbs throughout Texas, and we aim to keep on doing what we do best! We have service technicians on call for emergency repairs or we will work with you to schedule an appointment that fits your schedule. Whether you have a minor annoyance or a major malfunction, our trained team can quickly analyze what needs to be done, give you a binding price, and get to work to solve the problem. If your garage door – whether it’s at your home or your business – has seen better days and needs to be replaced, we will help you make the decision that best meets your needs and goes easy on your budget. We do it all not because we have to, but because our goal is to continue to grow our business, impress our clients, and exceed expectations. It is an old-fashioned philosophy, but it’s the Action way! To get started with your Denton garage door repair, installation or replacement, contact Action Garage Door, the reliable family-owned company that has been caring for customers throughout the Dallas area since 1984. Call us today at (877) 392-2590. 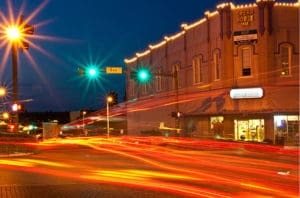 Denton is another one of those old Texas towns that developed its own persona and had an established character long before it became known as a suburban community of the Dallas-Fort Worth Metroplex. Located approximately 40 miles northwest of Dallas, and a few miles less than that from Fort Worth, it marks the spot in the highway where the two branches of Interstate 35 merge on their way to Oklahoma. Denton is sometimes known as “Little D,” and I35E takes travelers south to “Big D” while I35W follows a southwest route to Fort Worth. The city is perhaps best known as the home of two universities, and it has been a “college town” since the University of North Texas was established in 1890 and Texas Woman’s University was born in 1901. It is partly this “youthful” orientation that has distinguished the city as a music center. The Denton Music Festival and Denton Arts and Jazz Festival attract more than 300,000 visitors to the city annually. Early in its history, the area was farm and ranch land, as was much of North Texas. But the advent of rail transportation led to a growth spurt in the latter decades of the 19th Century, and the universities added to its prestige. A few manufacturing firms were established in the area, but the city’s population was relatively stable until DFW Airport opened in the early 1970s. Today, approximately 120,000 people live in Denton, and it is a growing city with a bright future. Although it has a proud history, Denton’s orientation is forward. The city even recently approval a proposal to demolish a group of historic buildings to make way for a planned development more in tune with future needs. It boasts a city-owned electric company and an airport, as well as three libraries, a water park and natatorium, numerous parks, trails and recreation areas, and a resource recovery park. Much of Denton’s housing stock is in the form of student-friendly apartments and duplexes, but there is a mix of single-family residences both in established neighborhoods and in new developments sprouting up on the fringes of the city. Some nine miles to the south, but still with a Denton address, is Robson Ranch, a planned adult community that now numbers about 3,000 residents and is still growing. The median price of listed homes hovers around $265,000 in 2016. Prices are trending upward throughout the DFW Metroplex, and Denton is no different, although the rate of appreciation is expected to slow somewhat in 2017. With dual cultural influences of college and ranching, Denton has a wide variety of activities for residents of all ages. It is home to the North Texas State Fair and Rodeo that is highlighted by both a nimal and food events, country music and rodeo. It is also the site of an annual airshow that attracts more than 10,000 visitors each year. Other annual festivities include a documentary film fest, a fiesta on the square, and an yearly Redbud Festival. 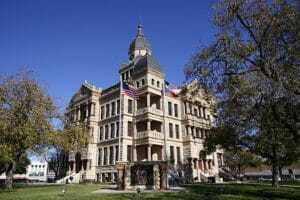 Denton is distinguished in two additional ways: Its historic county courthouse has an interesting museum with collections that focus not only on Denton County history and culture, but also on local African-American and Hispanic culture and on Southwestern Indian culture. Denton’s Shiloh Field Community Garden, situated on 14.5 acres of land, is the largest community garden in the United States. Operated and staffed by volunteers, the garden produces food for hungry Denton residents and, in 2014, more than 30,000 pounds of produce and eggs were distributed to local agencies. There are also plots available at no charge that can be worked by individuals and families who wish to grow their own food. a wide variety of eateries, many of them informal and catering to the college crowd. Traditional steak and potatoes restaurants thrive, and Mexican food is also a perennial favorite. Clubs with music are also a staple of the local entertainment scene, and it’s not unusual to find a weekend concert on the square or at the college. All in all, Denton is a happening place, with lots for everyone to enjoy! I called around to find the company with the best price/best ratings to install my new Chamberlain wifi garage door opener. This company was it! Awesome service, best price and they have Saturday appointments! The representative that installed my door did a great job and took time to help me understand all that my new system can do. Thanks Action! I felt the service was prompt and efficient. Brian was excellent. Great service. Great service. The service man was pleasant & explained the problem & was able to repair it immediately ! I would definitely referred them to my family and friends.